The Leiva Family - bvboys's JimdoPage! Mynor Leiva was the first Guatemalan the Johnson's met when they came to Guatemala in April of 2008. 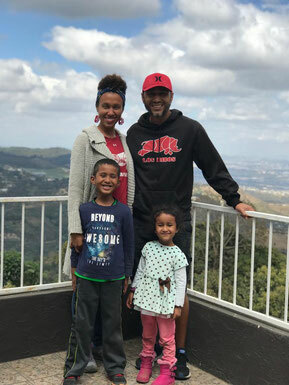 After a couple years of friendship, God would eventually lead he and his wife Walda to leave their careers and become full-time missionaries to their own people. To have a Guatemalan family who represent the traits we seek to teach the boys is an invaluable asset. Especially for the boys, Mynor's example as a dedicated man of God, a strong leader with a servant’s heart, and a loving husband, is exactly what they need to see on a daily basis. And as God would have it, Mynor is also an athlete. The Leivas bring a perfect combination to the ministry, as Walda holds multiple degrees, is a computer software engineer, and also a teacher. She too left a promising career to pour her heart into helping the boys of Buena Vista, the future leaders of a small poor village in Guatemala. Since joining the Academy, they have had a son named Noah, and baby girl, Ava Luna, born May 9, 2015. On a daily basis, Mynor is the head coach of the soccer program, and Walda oversees the education program. You can support the Leiva's by following the instructions below. Family Support: The Leiva's goal for family support covers their groceries, school costs, and all standard monthly bills. Their monthly budget has been reviewed and approved by the BVSA Board of Directors. To support the Leiva Family directly, CLICK HERE, and note "Leivas" in your check or paypal memo. Academy Support: The Academy in Buena Vista, Guatemala, where the Leiva's work, has its own monthly operational budget. This amount covers feeding all 36 boys and workers every day (over 800 meals per month! ), paying support staff, and all bills and operating costs for the academy and classroom, tournament entry fees, and uniforms and soccer equipment. If you would like to help support BVSA Guatemala, please CLICK HERE in order to make a donation directly to BVSA.